I am currently working away on the ice box or refrigerator on our Didi 40 Cr and the one thing keeping me going is thinking of a cold beer after a days sailing. There is many ways to make an ice box and I have chosen to use a low density foam on the outside 50 mm and higher density foam on the inside 20 mm so that the fibreglass will not have to be too thick. The two layers of foam are installed in the box waiting for the fibreglass to go over the top and the top and end of the box are made and detailed ready for the foam to be fitted to them in the morning. I have to remember to insert some plywood into the foam to hold the condenser as the light skin of fibreglass alone will not be strong enough. There are lots of little jobs going on in parallel and I have a very specific list of jobs written out before the day starts. I think I am down to just four bits of plywood to fit inside plus the holding tank to make but as I type this I realize that I need rod holders for the three hanging lockers. Also the locker lid for the battery box has not worked out as expected as the hinges pull apart the wrong way. I need to remove the lid to be able to remove the end engine inspection hatch so I have a bit of thinking to do on this one before I will be content. The car is full of engine compartment sound insulation and I want to install this directly onto the panels without putting them into temporary storage so that is another priority. One long outstanding job has been completed to my satisfaction. When I glued up the panels that form the head the 45 degree join was a couple of millimeters out of straight. Now I can see a couple of millimeters so I neatly cut out the glue from the join and reglued it with thickened epoxy and this time used a massive straight edge to hold it all in line. The door trim also fits into this 45 degree join and overlaps the first join. It is now in place also held straight with a straight edge until the glue cured. The 9 mm plywood door trim stiffens the door opening significantly so it is looking good. First layer of foam in the ice box. For the last two weeks we have managed to achieve fastest times in our Blue Division at Greenwich due to good starts and a clear run through Humbug. Last week our seeming race winning lead was extinguished by a new breeze coming down the course and only a lucky gust at the finish saved us. This week we escaped Humbug on the way out in a similar fashion and managed to hold onto a two minute lead all the way. At the start the breeze was a bit more East than last week and we could not make the start line of starboard if we sailed up the Lane Cove River. We had to run back to the fleet and gybe before the line of moored yachts so that we sat higher than all the fleet. With the bias on the line we had a good lead and could tack onto starboard at will. Even with freedom to tack we just shaved Onion Point of the way out which saved us a few more seconds. On the work back to Goat Island we were on the wrong side of two shifts off Greenwich and did not get back into phase with the changes until we settled into a longer leg along Snails Bay. I begged for wind to get above the concrete dolphins and we got just enough angle so that Frank, putting in a welcome guest appearance, could not reach out and touch it. A timely involuntary round up turned into a tack and had us back in phase. Worlds Apart was no longer steaming up to our stern as she had been coming into Long Nose. We sort of held our own for the run back around Cockatoo Island with the only real excitement being a late swerve to windward to avoid the protruding yard arm of the monster moored at the South East corner of Cockatoo. I heard another yacht in the fleet made contact so I am grateful for the advance warning I had from the crew. Back into Humbug we could see the earlier starters becalmed so we went below all the fleet and managed to shave Onions Point on the way back in. So all was well on the last race of the season and we won the handicap as well. The Christmas BBQ back at Greenwich was well attended by and well enjoyed by all with some very excellent prizes for the raffle donated by the generous sponsors. As much as I willed it Keith did not pull one of my numbers out of the hat and I had to go home without the Helly Hansen wet weather gear or the Back Vintage wind selection or the Wild Oats bags but we did win one of Back Vintage wines for our handicap win. Last week we struggled all around the course buried mid fleet and without any lucky breaks. An involuntary gybe at the corner of Cockatoo Island caused be a wind eddy forced us too close along the shore from where we never recovered. We were too close in at the West end of Cockatoo Island and caught in the wind shadow. Tacking back through Humbug we could not get into phase with the shifts and had a pretty average result. This week was a different story. We set the No 2 genoa in anticipation of a southerly front which came through just as the fleet was starting. The smaller overlap and more comfortable sail area meant we were quick to windward and tidy in the tacks. From the first tack we had Worlds Apart covered with Agrovation behind her. With clear air we could pick our course and at the same time keep a loose cover on Worlds Apart and an eye on Agrovation. We did not see the rest of the fleet after we rounded Cockatoo Island and were enjoying our time at the lead. Agrovation sailed into the wind shadow off Long Nose and around Goat Island we managed to stretch out the lead on Worlds Apart when they were caught in a light spot in the lee of Goat. The breeze had dropped away to seven knots as we approached Greenwich when it freshened from the South bringing Worlds Apart charging up to us and past us. There was little we could do as the breeze we were in was lighter and tighter and until the fresh breeze arrived we could not pole the genoa out to windward. Once Worlds Apart was past us we managed to get the genoa drawing and sat on their stern blanketing them as much as possible as we entered Humbug. Luck was back on our side as a fresh gust from behind gave us an inside overlap at Onions Point and with a dead square run to the finish we all had clear air. Being to leeward boat the angle of the finish line favoured us and we reclaimed the fastest times win by a quarter of a boat length. While we could see only Worlds Apart and Agrovation at the finish the freshening breeze brought all the fleet home and despite that we managed a third on handicap. 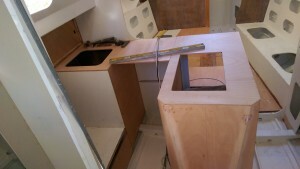 Galley furniture in our Didi 40 Cr taking shape with sink and ice box openings cut. I have been pushing ahead with the engine compartment and galley so that I can get the floor levels and edge support in these areas established. So the engine compartment is temporarily installed with screws so that I can remove it from the hull for painting and fitting of the insulation. While it is out I will fit the foam to the fridge so there is a bit of work piling up. 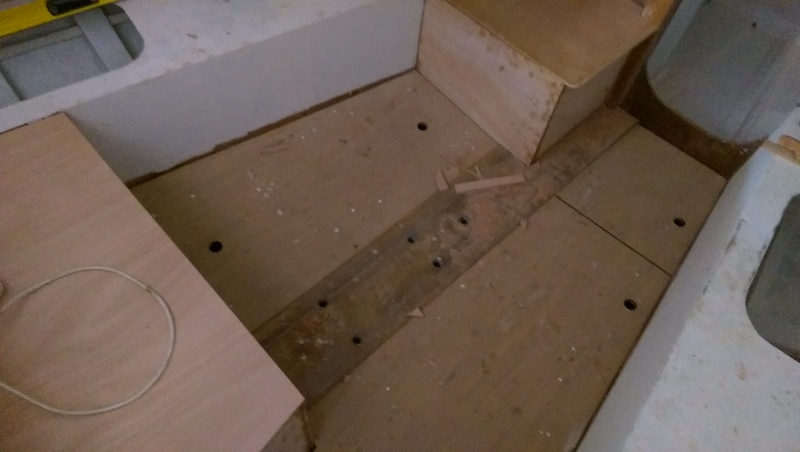 With the engine compartment in place I fitted the companionway floor supports and fitted the first floor panel. It was a good fit but the surface was a bit too slippery and the feet of the ladder slipped before I had a chance to install some cleats. The result was a nasty fall down the companionway with my body inside and my arm outside so I have a couple of bruised ribs and a forced rest. There were lots of cleats in the engine compartment and galley to be glued and that was a good light task for my condition. I even managed to install the sliding doors behind the stove and fridge. While doing these jobs I thank my father Ted for his example of wood work and all the skills I picked up from watching him. Still in search of light duties I mapped out the drawers for the galley and settled on three narrow drawers and one deep one. I cut the surrounds and rails on the circular saw bench and did a trial fit with a couple of 9 mm ply panels that will be the 18 mm thick drawer fronts. I was so pleased with my first floor panel in the companionway that I put up with a bit of pain to cut out the panel that runs down the side of the engine compartment to the settee area. 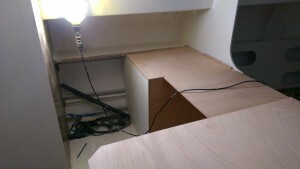 It is trimmed and fitted now and provides a nice unobstructed route through the hull. That was the last of the 12 mm plywood so I will have to order another two sheets to finish the balance of the floors. I must paint the battery compartment as a matter of priority so that I can install the first couple of batteries and get the electrics under way. I will remake the instrument panel as the 6 mm ply I used was too floppy and distorted. I have some very nice seven ply 9 mm sheets that will do the job well. Sliding doors behind the stove and ice box are completed but for painting. Floor in the dining area and false floors inside the seats are fitted. Galley panels for our Didi 40 Cr are cut and waiting for cleats to be fitted. The hardwood rails for the galley sliding doors will go in this space behind the fridge and stove. I broke one router bit on the first few centimetres so reverted to the circular saw to cut the grooves. After several weeks where tedious fibreglassing took up most of the time I am now building in furniture from plywood sheets. The first structure was the extra seats that form the “U” shaped sitting area. The front seat is for general storage while the back seat will house the battery bank. The structures are built, the false floors added and the lids cut. They still need to be painted and the lids hinged but the upholsterer can now measure up the last two seat cushions. With the seats in place I was able to cut the temporary plywood floor into the final shapes and add edged supports where needed. 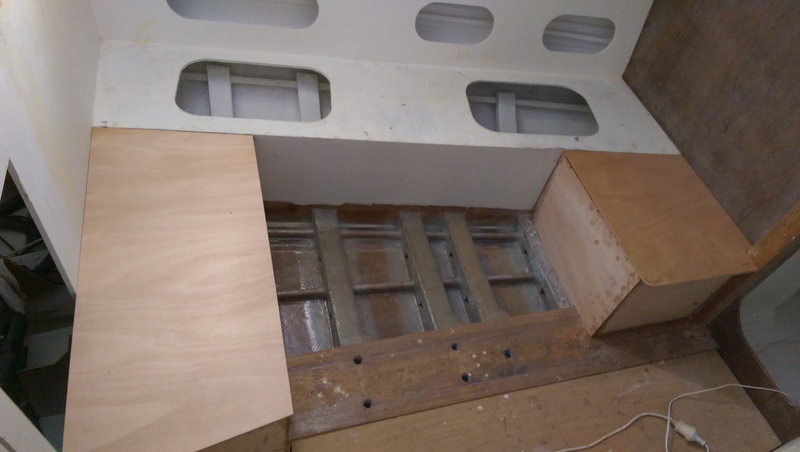 The settee area with the new seats provided a very good working platform to start on the engine compartment and galley furniture. It is quite a tight fit with just 475 mm between the quarter berth ante room wall and the galley top and the engine enclosure cannot be any smaller. I had to cut a hole in one side of the engine enclosure to give some clearance to the bigger alternator on the new Yanmar YM30. 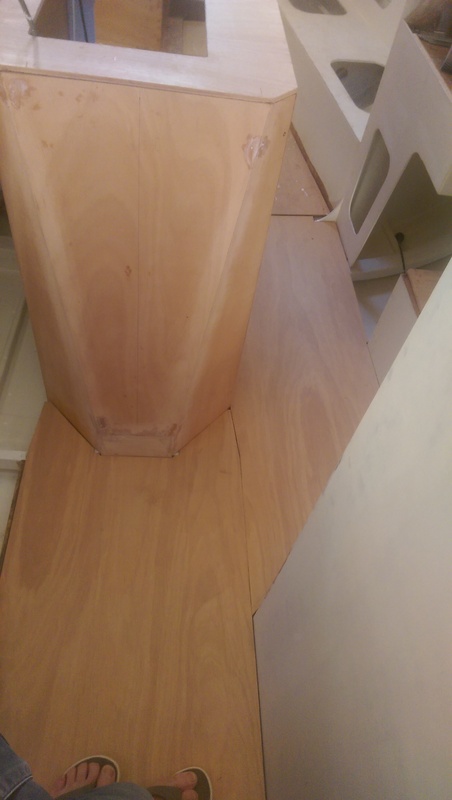 The hole is inside a cupboard so it will not seen but it showed how tight a fit it is. I also cut holes on both sides where the nuts on the engine mounts interfere with the side panels. Tonight all the plywood panels for the top and sides or the galley furniture are complete. I still have to cut the end panels of the engine enclosure and will make them a stitch and glue item I will edge glue the sloping and angled pieces and once cured remove it from the boat and glass the corners on the shop floor. 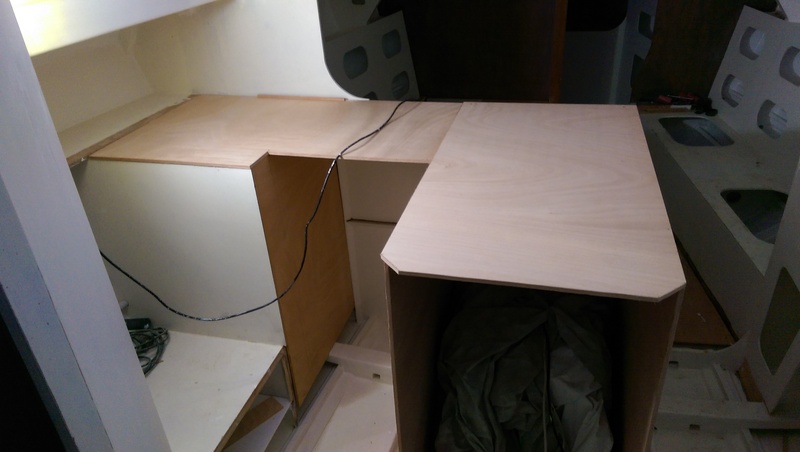 I have to work out the detailing of the drawers in the galley and will probably do two drawers in the top half and one big deep pots and pan drawer in the bottom half. 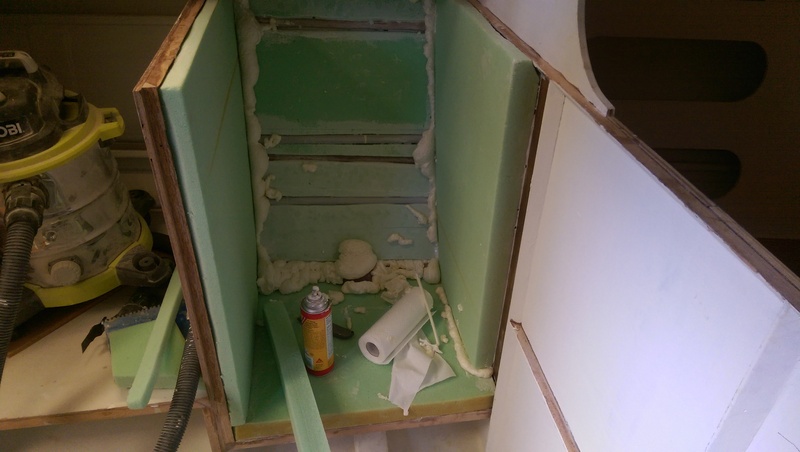 There is lots to do including fitting the foam into the refrigerator and making a good insulated lid for that and also fitting the sinks into the galley top. 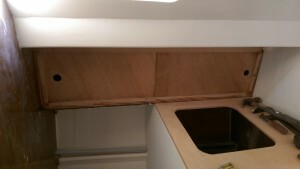 With the galley structure in place I can now start thinking about the floor support cleats. The finished king plank on the keel of our Didi 40 Cr. It is 100 mm wider and 3 mm thicker than the original design and the extra 100 mm with is made from hardwood to spread the keel bolt loads. I have passed another milestone with the completion of the glassing of the keel floors to the hull. Once that was completed and I cleared all the limber holes I slapped on a coat of epoxy. While the epoxy was curing I started cutting plywood for the engine compartment and by the time I had the two sides cut the epoxy was cured. The yacht has been so warm that I have mixed only small batches of epoxy as the pot life is very short in the hot weather. I will paint on a couple of coats of epoxy paint before we launch but I can now get on with building the seats at the ends of the settee that will go over the king plank. 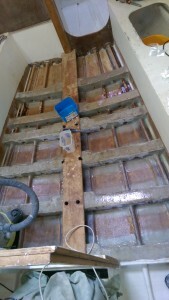 The king plank has been augmented with extra hardwood down both sides to share the pressure from the keel bolts. Dudley’s detail show small packers under the keel bolt washers but I have extended these for the full length of the king plank. The king plank sits on top of the keel and forms the top of an “I” beam. The keel and plywood skin are the bottom of the beam. The longitudinal beam spreads the forces from the keel bolts among all the floors and in particular spread the loads if the keel touches bottom at speed. The standard design has a 15 mm thick king plank and with our deep keel Dudley increased it to 18 mm thick. With the extra width of timber along the full length of the king plank we have gone from 150 mm by 15 mm to 250 mm by 18 mm and the additional 100 mm is hardwood so the beam is much stronger than the original. The shear stress in bending of the beam is taken by the six massive keel floors which at that point are 110 mm wide and 80 mm deep. Congratulations to the Groves clan for winning the fastest times contest in the Blue fleet at Greenwich Flying Squadron. It was a tough battle between the three Jeanneau designs, Agrovation, the newer 379, Passion a 2006 Jeanneau SO37 special and the larger Worlds Apart, a 39i Performance. Agrovation was always going to be the one to beat. They have a nice set of Carbon sails and sail the boat well. Any time we can beat them we think ourselves fortunate and this was the case in the last race of the Spring series. We started in light conditions with a gust of wind in our starting sequence that ensured we all arrived at the line on time unlike the earlier fleets that had struggled to get into the starting box. We were sandwiched between Worlds Apart in front and Izzi to windward as we beat up the Greenwich shore line. We were close to the line of moored yachts when Worlds Apart tacked away leaving us clear air. To windward Izzi was preventing a free tack so we needed to go right to the prohibited zone before we could call for room to tack. We never called. Izzi tacked away when it looked like we would need to tack and suddenly we got a big gust from behind that lifted us around the last moored boat. That was the last reasonable gust for the next 20 minutes but we had a couple of knots of breeze and were out of Humbug unlike the rest of the fleet that were becalmed. We were almost at Cockatoo Island when the fleet struggled out of Humbug with new breeze from the East so while we tacked to the Island they were reaching along. I was instructed by the crew not to look behind and there were promised of blinkers for Christmas to keep me focused on where we were going. On the beat to Goat Island Agrovation took the Greenwich shore and seemed to be going at twice our speed. Once past Long Nose we were in similar fresher wind and we seemed to hold our own. It was look behind for all the run back to Humbug and I was relieved when we made it into Humbug with a few boat lengths to spare. Very cleverly Agrovation took the Onions Point tide into consideration and shot the point while we had stood off enough to give them clear air. Now we were side by side going for the finish line. Agrovation normally points higher than Passion so we were surprised that we could keep a good line with wind across the sails right to the mark with no room for Agrovation. At the last minute she tried to shoot the mark but the angle was just too sharp so she had to do a recross of the line. In the light conditions the recross cost a couple of minutes and must have been frustrating for the crew but they recrossed in second fastest place to seal the series. Worlds Apart had an unlucky series as they were in front several times only to be beaten on those occasions by the conditions. It might be the last Spring Series for Passion so it was nice to finish on a high note beating our long time rival. Congratulations to Michael Murphy and family in another Jeanneau, French Connection, for blitzing the handicap series and to Alan Grundy in Farrst Company who came good once the hull was antifouled. Alan and family finished with two handicap wins out of the last three races. There is no external progress to show but inside the boat a lot of time has gone into fibreglassing the water tanks and glassing the keel floors to the plywood hull. The tanks are lined with 6 oz epoxy saturated glass which has been sanded to remove loose ends, epoxy coated again and primed. The last stage will be to paint on the potable water tank liner. The settee front that form one side of the tanks have been grouted to the hull and glassed in with two layers of 6 oz glass on the inside of the tanks. On the external side they have been grouted to the hull and glassed in with two layer of 12 oz cloth. The 9 mm ply of the settee fronts running fore and aft lock into all the keel frames forming a very strong structure but the connection around each of the six keel floors has to be water tight so it requires some care. To be honest if it was just a cruising yacht I would have put the water tank under the V berth where there is a massive space. That is where it is in my Jeanneau 37 and the upside is that the space under the settee can be used for storage. Because we are keen on speed we are keeping the water tanks central where the weight will be more useful. 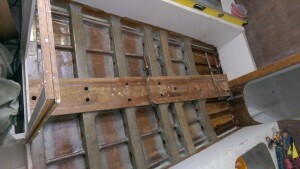 The keel floors have now been all glassed to the plywood hull with four layers of 12 oz cloth which is over 2 mm thick. Personally I think this is unnecessary since the floors are connected to the ply hull with solid meranti timber which is 80 mm wide. If the frames were glass over foam like we added to our Jeanneau SO37,Passion, then glassing to the hull is essential both for transmitting the shear forces in bending and for adding skin side strength. In the case of our Didi 40 Cr we have gone for a deep keel and the extra loads are fully adjusted for by widening the laminated timber floors from 70 mm to 80 mm. I have added 2 mm of glass to the frames to increase the factor of safety. This I did on the shop floor before installing the floors in the hull 18 months ago. The intention was to add 2 mm of glass to the external hull again as an increase in the factors of safety. Between the designer and me we have double up on the glass. He wanted 2 mm of glass over the keel floors on the inside as well as all the glass included in the extra factors of safety calculation. I thought that was overkill based on my calculations but needed to build according to the drawings. I tried to negotiate to put the extra 2 mm of glass on the external side of the hull where it is more effective and laid up a full 4 mm of glass across the hull centre line in the area of the keel floors. The designer would not agree so we have also the 2 mm tabbing the frames into place. I guess is that the factor of safety is now over 5 compared to a design requirement of around 3 and it has been only an extra 20 man days to do all the reinforcing. That time includes glassing the individual floor with 2 mm of glass, applying eight layers to the hull in the keel area while it was upside down and glassing in the floors from the inside on my hands and knees. Most of the glassing is completed including the front floor which is now tabbed to the ply skin with 2 mm of glass.